Five men have been arrested and a large number of guns seized during a crackdown on deer poaching. Sussex Police said 50 officers found firearms, animal carcasses and meat, including deer and wild boar, during dawn raids across the county on Monday. 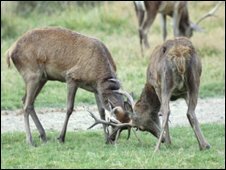 Five men, aged between 21 and 74, were arrested on suspicion of carrying out offences under the Deer Act 1991. Police said they were responding to concerns about "highly organised poaching for big profits". Officers from the National Wildlife Crime Unit and staff from the RSPCA, Trading Standards, Rother District Council and the British Association for Shooting and Conservation, also took part in the raids on properties in Bexhill, Brightling, Ninfield, Robertsbridge, Salehurst and Broad Oak, Heathfield. Ch Insp Heather Keating said: "This is not a romanticised image of the local poacher taking one for the pot, but a highly organised and criminal taking of wild animals for big profits. "We are responding to local concerns about the scale of the problem and will continue to react to any direct reports of poaching or evidence of its taking place, such as discarded deer heads, feet and entrails." Alan Roberts, from the National Wildlife Crime Unit, said: "Commercial poaching is a serious problem on various levels including public health, where meat is introduced illegally into the system, and public safety, as many of the deer are shot at night using high powered weapons. "There is also a significant risk to animals not killed in a clinical, professional manner and with weapons not suitable for the size of beast." The five men, from Heathfield, Robertsbridge and Ninfield, all in East Sussex, have been bailed until 8 June.